The House just passed the Creating Hope and Opportunity for Investors, Consumers, and Entrepreneurs Act, otherwise known as the Financial CHOICE Act of 2017 (H.R. 10). Lee Zeldin was a champion of the bill and just issued a press release touting its supposed benefits. As has been his wont, Zeldin (like his puppet master Trump) can’t find anything to commend in legislation enacted by the Obama administration. The Consumer Financial Protection Bureau (CFPB) is a federal agency charged with protecting American consumers as they navigate our nation’s complex landscape of financial products, ranging from credit cards and payday loans to mortgages and student loans. Created by the Dodd-Frank Wall Street Reform and Consumer Protection Act in 2008, the CFPB monitors both traditional financial service providers like banks and credit unions, as well as other providers of consumer financial services like auto lenders, debt collectors and others. In addition, the agency works to educate consumers about financial services products and, through its Office of Consumer Response, helps consumers resolve individual disputes or concerns. Through its work, the CFPB has returned almost $12 billion to 29 million American consumers and has helped guard hundreds of thousands more against unfair, deceptive, or abusive products and services. And yet numerous proposals in Congress as well as recent legal actions could severely hamper the agency’s ability to serve as a fair and impartial advocate for consumers. Specifically, pending legislation would all but decimate the agency, including legislation that would dismantle the agency, replace the independent director with a five member commission, or change its funding structure to require annual appropriations from Congress. This report from New York City Comptroller Scott M. Stringer focuses on how the CFPB has helped protect consumers in the nation’s financial capital, New York City. Drawing on data from the agency’s Consumer Complaints Database, this report highlights the tangible assistance the CFPB has delivered to New Yorkers struggling with financial companies or products. The Database comprises nearly one million consumer complaints dating back to July 2011 and provides a rich set of data about the challenges facing consumers. New York City residents lodged more than 23,700 complaints between December 1, 2011 and January 13, 2017, dealing with a full spectrum of financial issues. As the database has expanded to include more types of products, the number of complaints from New York City residents has risen from about 2,400 complaints per year in 2012, to almost 7,000 per year in 2016. 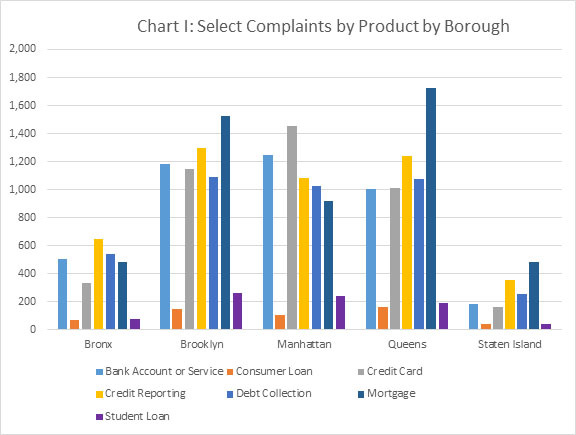 Almost 22 percent of New York City complaints focus on mortgages, 19 percent concern credit reporting, and 17 percent pertain to bank accounts, credit cards, and debt collections. Over 90 percent of New York City consumers who submitted a complaint to the CFPB received a response from the target of their complaint, receiving either an explanation, a resolution to their issue, or monetary relief. Reflective of the differences in New York City’s neighborhoods (Chart I), there is variation in the types of complaints based on borough. While mortgages were the issue most frequently raised by residents of Brooklyn, Queens, and Staten Island, the most frequent complaint from the Bronx concerned credit reporting. The most frequent complaint from Manhattan concerned credit cards. The increasing number of complaints and CFPB’s effectiveness at helping to resolve them demonstrates the important role that the agency plays in protecting New York City consumers. Proposals to scale back the scope and independence of the CFPB are misguided and should be rejected so that New Yorkers and all Americans can continue to enjoy the benefits of having a strong financial services regulator working to protect consumers every day. This entry was posted in CFPB, GOP, Student Debt, Student Loans, Tax Reform, Trump and tagged CFPB, CHOICE Act, Dodd-Frank. Bookmark the permalink. Good for Comptroller Scott Stringer for pointing out the benefits of the CFPB, and good for Bruce Colbath for making the connection between Stringer’s report and Lee Zeldin’s abandonment of consumers of financial services. Zeldin’s explanations for wanting to eliminate this small agency are inane. It is the most effective agency at pursuing financial institutions that have sold products, and pursued credit, debt-collection and other practices, that are unfair, deceptive or abusive. Zeldin is carrying water for financial institutions against the pesky CFPB and doubtless hopes to increase his campaign contributions by doing this. Maybe he will, but we will be watching and Zeldin will be facing a lot of questions from voters about this (as well as so many other matters) between now and November 2018.